E-Commerce is the magic word in the era of web enablement. In this era of internet driven innovations, a rising number of professionals are engaging in innovative business models and services within their own. There are further numerous professionals employed within the domain as experts. 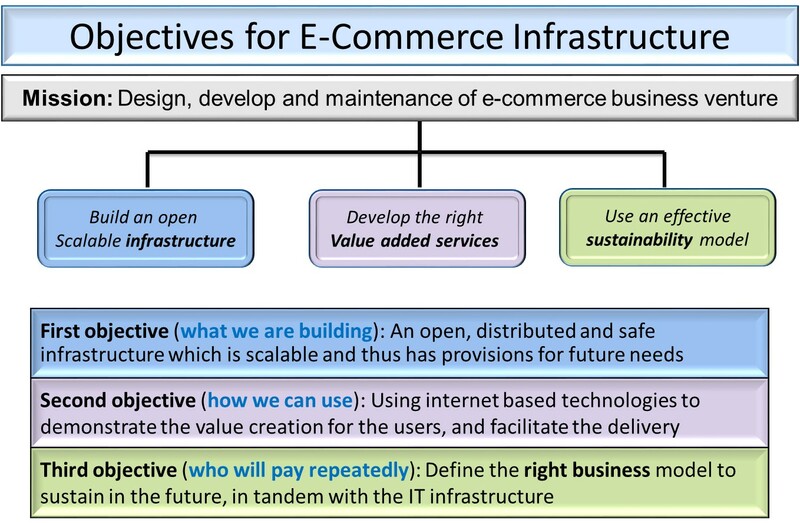 This article provides an overview of E-Commerce Infrastructure Planning and Management. 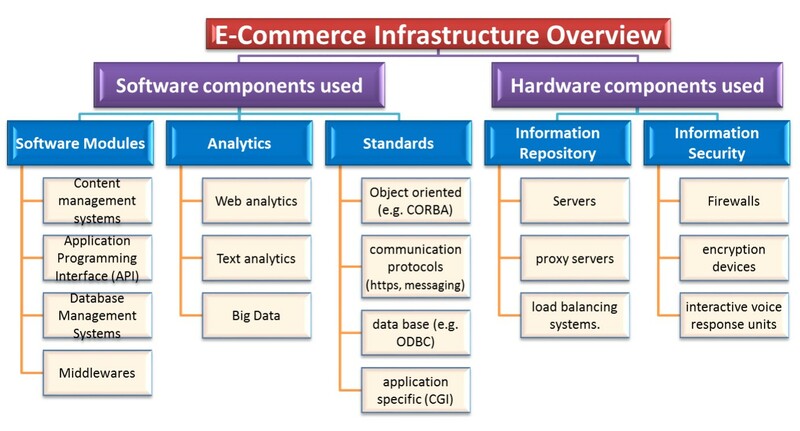 E-Commerce Infrastructure identifies the functionalities of the Hardware and Software components, specifies the corresponding service level requirements, and describes the management and operations of the whole system. It may comprise briefly of the following components at a very abstract level. Hardware components used: Servers, proxy servers, load balancing systems. Firewalls, encryption devices and interactive voice response units etc. Middleware: Systems that resides between the client (user) and the server (database and application resources). These could be data access components, communication protocols, specialized servers, or a mix of all. Lookup Database: This is the database that stores information about network resources and user profiles. Enables usage of network resources based on entitlements. Flexibility: The ability to respond quickly to changing requirements, and scale up based on the need of the customer. Resource virtualization can be an important factor in such a scenario. Costs: The CapEx & WorkEx, like acquisition and maintenance costs for servers, licenses and other hardware and software. License cost and its renewal policy would also play a significant part of the evaluation. Scope & performance: Factors include degree of fulfillment of specific requirement, knowledge about service and performance quality. Service uptime could be another sub-criteria. IT security & compliance: Factors like government, industry and firm specific needs in the areas of security, compliance and privacy are covered. How the information assets are protected could be a regulatory issue. Reliability & trustworthiness: Factors like service availability, consistency of delivery and fulfillment of the Service Level Agreements. Whether the consumer can get the same uniformity of service every time, is the evaluation parameter. Service & cloud management: Factors like offered support and functions for controlling, monitoring and individualization of the web interface. 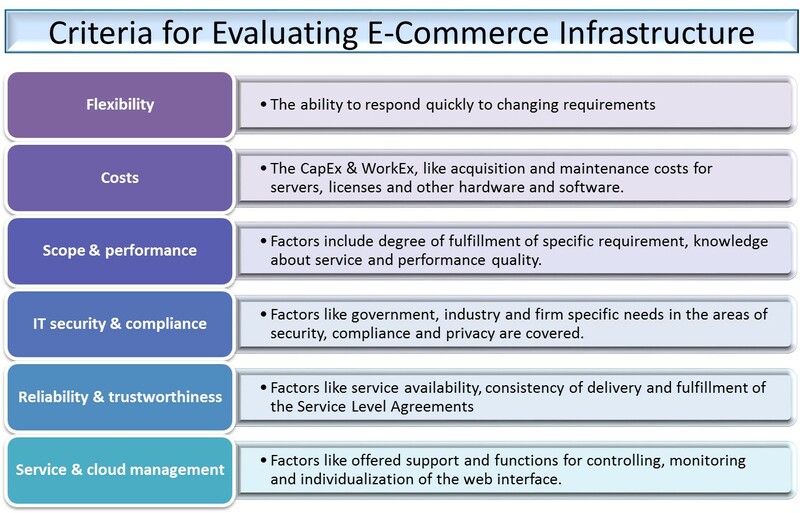 Further, professionals need to understand the Performance Models associated with E-Commerce Infrastructure, which may be useful during audits. A model is a representation of an information system. It could be physical, logical or functional. The model should be as simple as possible. It should be capable of capturing the most relevant characteristics of the system under evaluation or audit. The performance of e-Commerce site depends on the pattern of services requested by customers, as described by customer model. It also depends on the demands that each service places on the site’s resources and the intensity at which customers arrive at the site. 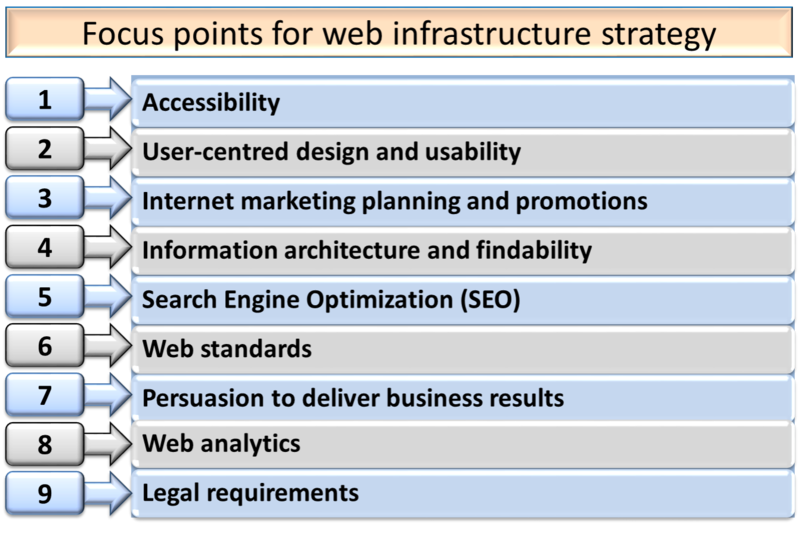 Other important dimensions include adequate site capacity, Scalability and Fault-tolerance. Which files are being requested frequently? Which content configurations are requested frequently? Which processes deliver that content? Am I paying too much for my ISP service contract? Can I get by on a lower-bandwidth contract? 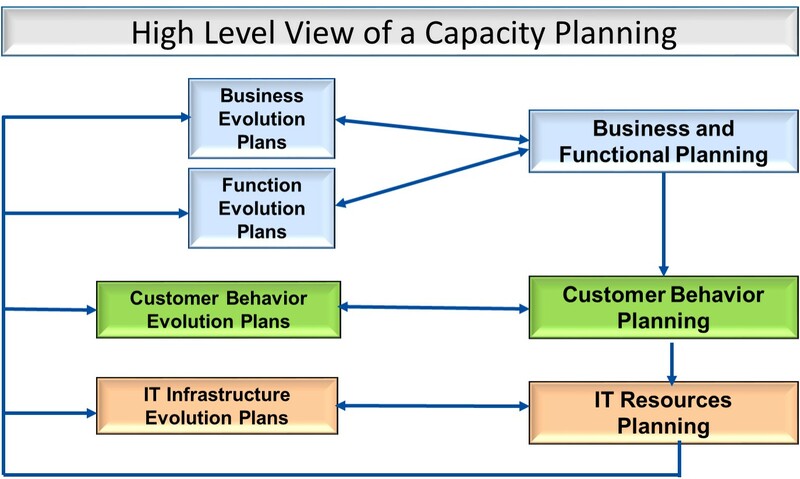 Capacity planning would address these requirements through a cycle of workflows of analysis in a multi-stage approach. Interaction Model: It focuses on how a user interacts with the e-Business site to execute the function. Example: two consecutive HTML forms may be needed to implement the function of online application to a course. Web Technology Used: Different technologies may be used to implement an e-Commerce function. E.g. HTML forms, Java Applets, Active X controls. Suitability of technology chosen to fulfil functional needs would have paramount importance. Use of User Credentials for Authentication: This information specifies if an authentication protocol such as SSL is used to implement the e-Commerce function. This would have significant importance in terms of security and information assurance. The Customer Behaviour Planning would comprise predominantly on the Business Intelligence aspect to mine the customer’s preferences and purchase behavior and make suitable recommendations. Techniques like classification, pattern association and sequential rule mining may be used to meet the requirements of this stage. The IT Resource & Infrastructure Planning would focus predominantly on the specification of the workload model. This would entail a series of activities focusing on workload estimation, workload specification, performance modeling and calibration for validation. Further, based on the performance modeling output, cost-benefit analysis of the system needs to be completed. Subsequently the IT Infrastructure Evolution Plans can be drawn based on the completion of this analysis. We hope this article provides you a deeper insight of the activities and strategies which needs to be planned for when you are initiating an e-commerce venture. Please do let us know if you have further queries.